2010 NFL Picks Chicago Bears vs New York Giants NFL Predictions Week 4 - It’s an “old school” NFL Picks match-up when the New York Giants (1-2) play host to the Chicago Bears (3-0) in the new Meadowlands. The Bears pulled big upsets the past two NFL Predictions games while the Giants have struggled against AFC South competition. Nevertheless, Las Vegas Odds makers have posted the Giants as -3 1/2 point favorites at home. The two teams have only played three times since 2001 and the Bears have won 2 of 3. 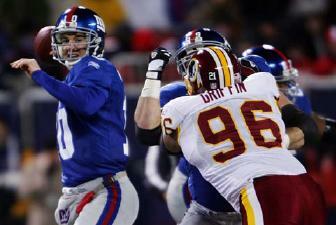 The Giants have struggled offensively as quarterback Eli Manning has had trouble protecting the ball. Eli Manning has thrown for five touchdowns and more than 800 yards but also has had six interceptions. He has also been sacked 7 times and has been plagued by an inconsistent running attack. Steve Smith, Mario Manningham, and Hakeem Nicks have made an explosive trio at wide receiver, making the Giants a top 10 passing offense. Yet, the team has lost by 24 and 19 points the past two weeks and the offense needs to find some equilibrium. The Bears are ranked #1 in the NFL in rush defense and have benefited greatly from the return from injury of Brian Urlacher in the middle of that defense. Urlacher and fellow linebacker Lance Briggs lead the team in tackles. The team has yet to apply any consistent pressure on the quarterback but have forced 8 turnovers against top offenses such as Green Bay and Dallas. If the Giants are to cover the NFL Point spread and come-out of this game victorious, Manning must protect the ball and they’ll need to find a running game. The Bears, though, have shut down opponent’s running games, forcing the pass. Manning should be able to pass on the Chicago defense that is ranked near the league’s bottom but the Bears should have enough firepower on the other side of the ball to not only cover the NFL Point spread but pull another road NFL Picks upset. Vegas-spreads.com 2010 NFL Picks Wek 4 play is on Chicago Bears plus the points. This is sportsbook.com NFL Predictions Game Of The Week Game. Join now and receive a 25% Sign up Bonus. NFL Point Spreads at Sportsbook.com get +3½ on this NFL Picks game.